To help you manage each step of the rental cycle, there’s four main stages of an opportunity in Current RMS: inquiry, draft, quotation, and order. You’ll see these represented by a segmented circle that fills up as you bring your opportunity closer to completion. In this guide we'll run through the four stages of an opportunity and what you might use them for. Inquiries (or enquiries, depending on your language settings) are great for general information gathering. For example, a client may call up about a prospective event in a few months time. Record the details in your Current RMS system as an inquiry so it’s there for you to follow up on. At inquiry stage, you probably don't have all of the information you need from the client so the only required field is the subject. Use as many or as few of the fields as you like. 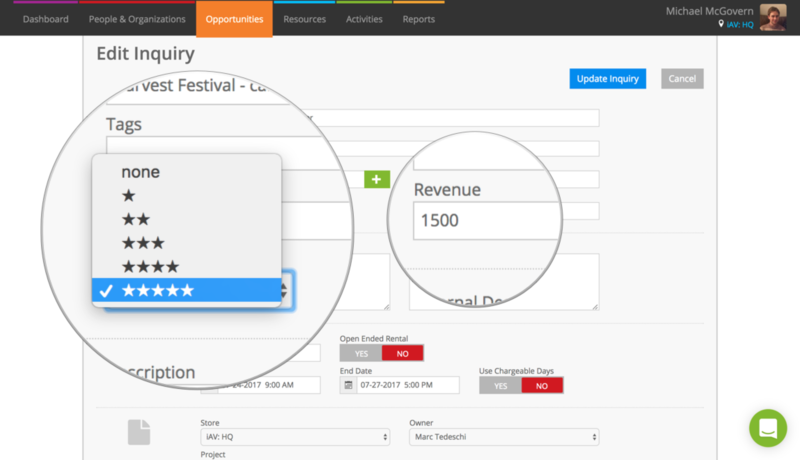 Unique to the inquiry stage is the ability to add a rating and projected revenue, so you can search and sort for inquiries that match these criteria later. When you’re ready, convert your inquiry to a draft using the Convert to Draft link under Actions on the details pane. A draft is a bit like a scratch pad, useful for building an order before making any concrete decisions about stock. 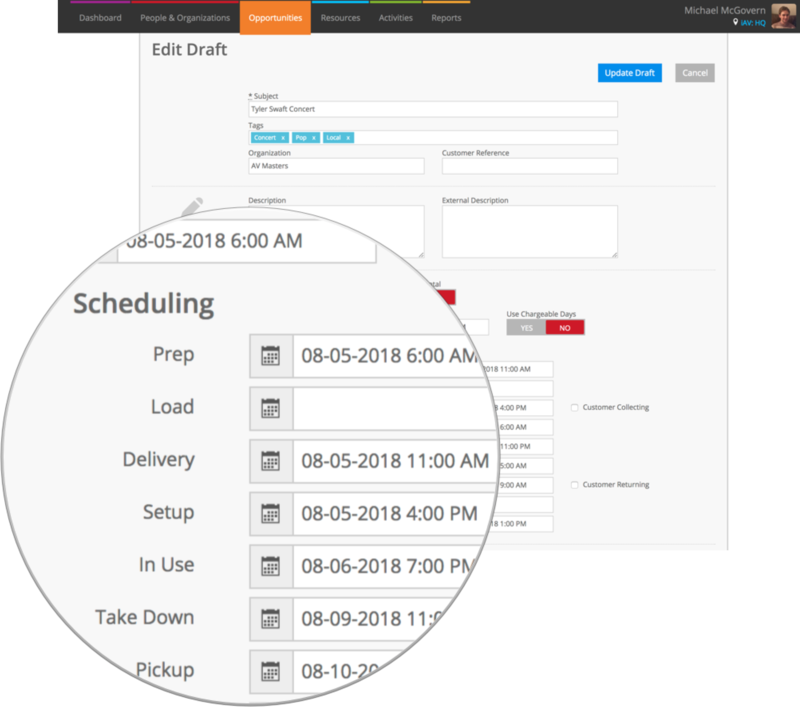 Unlike inquiry, at draft stage you can set dates in the extended scheduler (if enabled) and choose a venue or delivery address for this opportunity. Edit your draft using the pencil icon to add these. You also have the ability to add items to your opportunity. Items added to a draft have no impact on your stock levels; as a draft order, Current won’t take products out of availability or book services. Bring a draft up to a quotation by clicking Convert to quotation under the Actions on the details pane. A quotation is a detailed proposal or pricing estimate that you intend to send over to a client. Opportunities at quotation stage in Current have all of the same fields and features as a draft, but your products are marked as “quoted for” at this point. You’ll see this reflected in your availability screens and even in the picker when building other opportunities. You may mark a quotation as reserved to take stock out of availability for it. Current RMS comes with seven quotation layouts to choose from out-of-the-box and it’s at this stage that you’ll want to send one to your customer. With online document approval, you can send your customer a copy of the quotation online that they can accept, reject, and comment on instantly. If accepted, move your opportunity along to an order by clicking Convert to an order under Actions. This is where you can start allocating and booking out assets. An agenda-style overview of all labor and transport for this opportunity. New documents are available to you here; you can print rental agreements, picking lists, and delivery notes under the Print heading on the details pane. 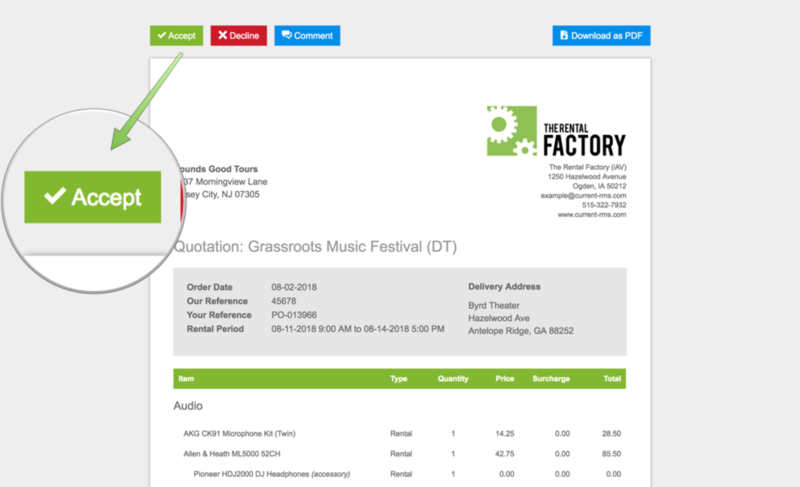 If you’d like, you can also create full or part invoices for the order. 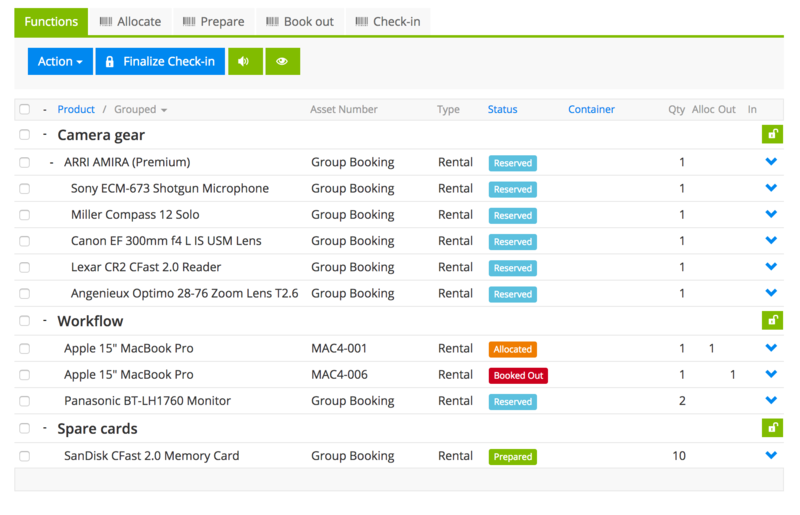 Use the green detail view or service view buttons to progress the order to active by taking care of the prep or scheduling. Can I revert to a previous stage? Move an order back to a quotation by using the Revert to quotation link under Actions. This link is available when no items on the opportunity are booked out, checked-in, or completed. You can’t move from a quotation to a draft. This is to prevent gaps in your opportunity numbering sequence. Quotations are assigned an opportunity number; draft orders do not have opportunity numbers. Draft, quotation, and order hold much more information than inquiry, so there’s no way to revert back to inquiry stage.